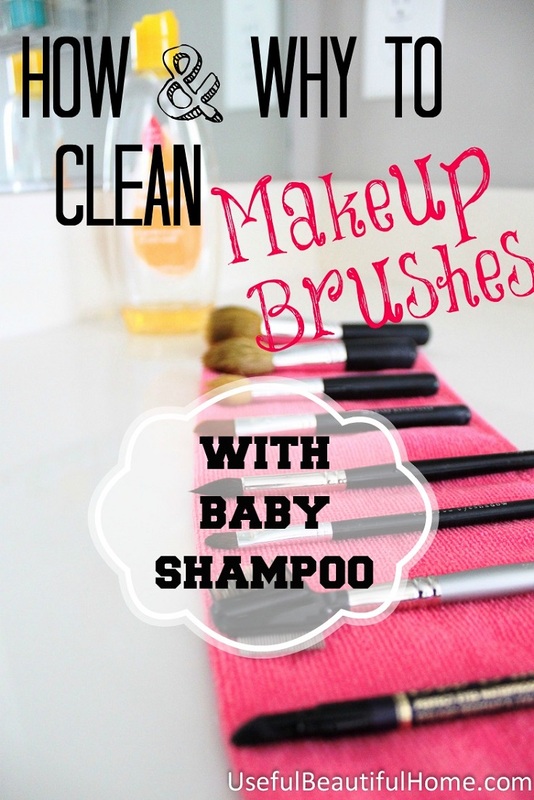 Everyone who uses makeup on a regular basis should know that makeup brushes have to be cleaned often. By cleaning your brushes you are not just getting rid of old makeup but also you will remove dead skin cells, dirt and bacteria buildup which can lead to infections, blemishes and irritations on your skin. The process is very easy and it can be done with just a few ingredients that you probably already have in your home such as lemon, baking soda, baby shampoo or vinegar. In this article we have collected tips and things you need to know about cleaning makeup brushes and also we will show you a few ways how to do it. If you follow these steps your brushes will be full of live, and your skin will be very thankful! 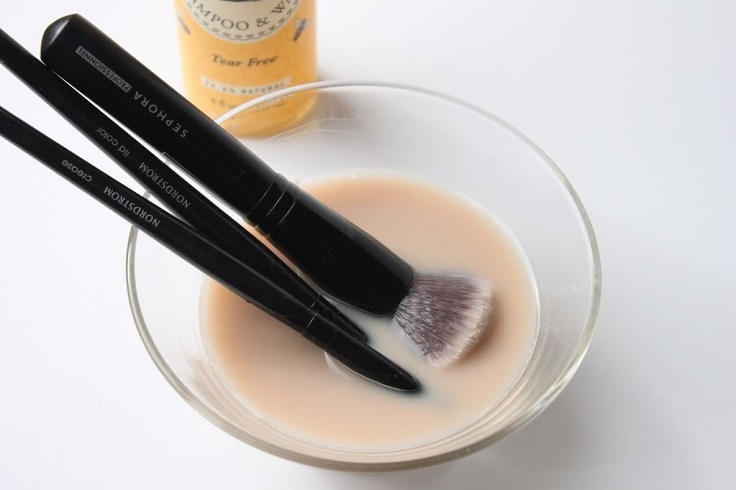 Make sure to wash your foundation and main eyeshadow brush once a week because they easily get dirty. 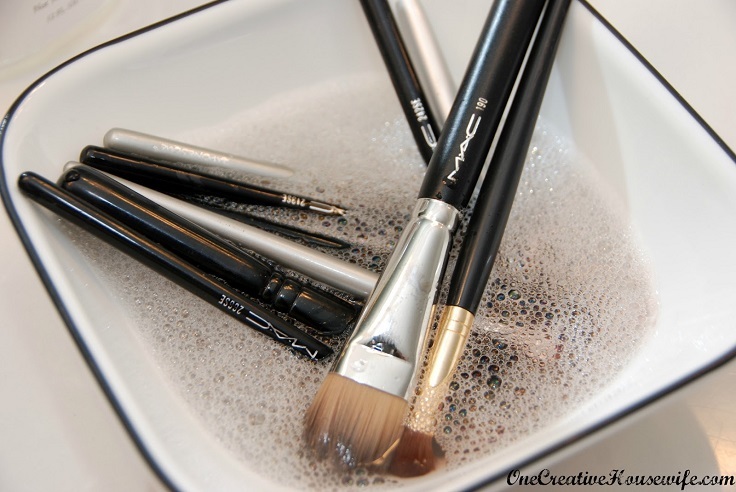 If you don’t have so much time try to wash all makeup brushes you use the most, at least once a month. Use lukewarm water and baby shampoo or liquid soap and clean them thoroughly. To make this natural cleanser, you will need two teaspoons of white vinegar and a cup of hot water. The vinegar will work its way into the brushes and remove all the dirt. For more information about this DIY cleanser click on the link below the picture. 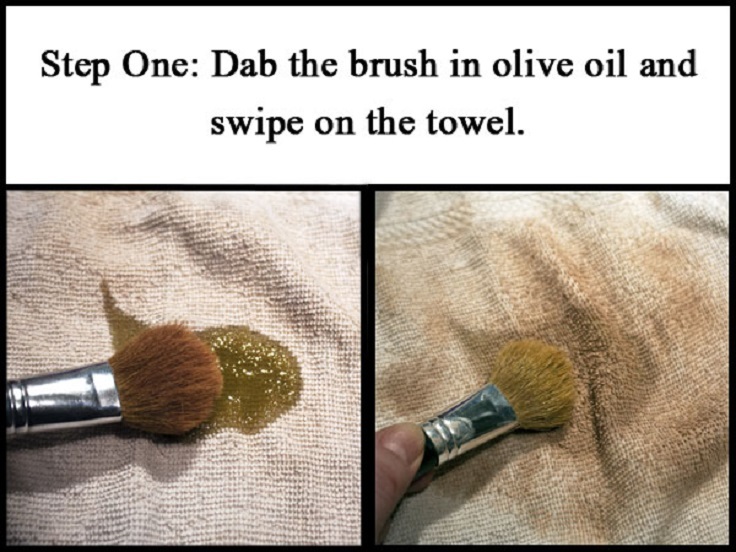 Olive oil works perfectly as a natural makeup brush cleanser. It’s not only cleaning the brushes but also cares for them, the same way your conditioner nourishes your hair. It makes the fibers softer and also removes the dirt. 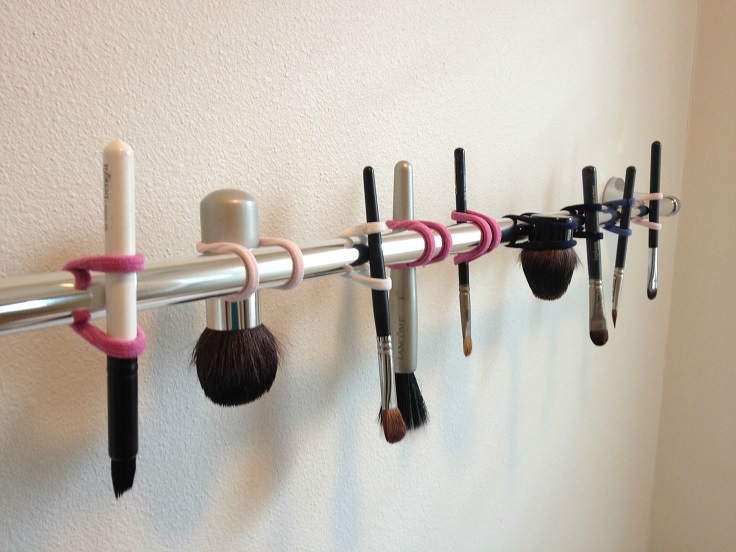 Alternatively you can do this as the first step before giving your brushes a bath. 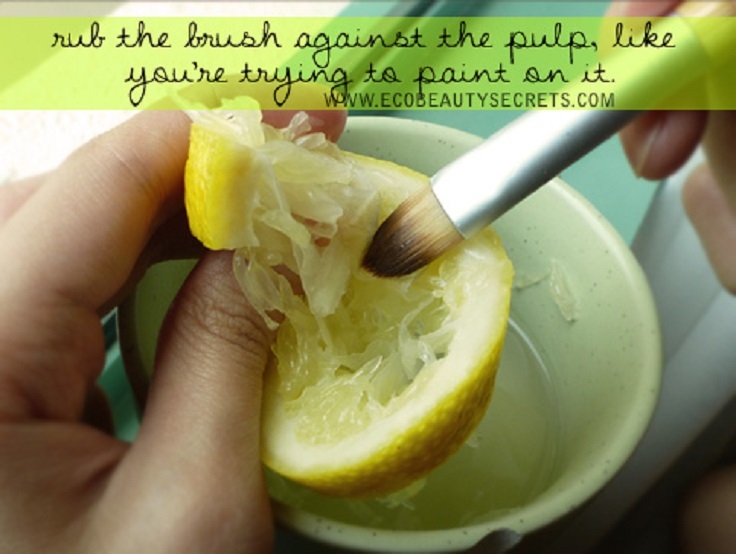 Another fantastic idea is to use fresh lemon as a natural makeup brush cleaner. Lemon has antiseptic and antibacterial properties. You can use lemon juice as the second step after cleaning the makeup brushes with white vinegar in order to eliminate the vinegary smell. 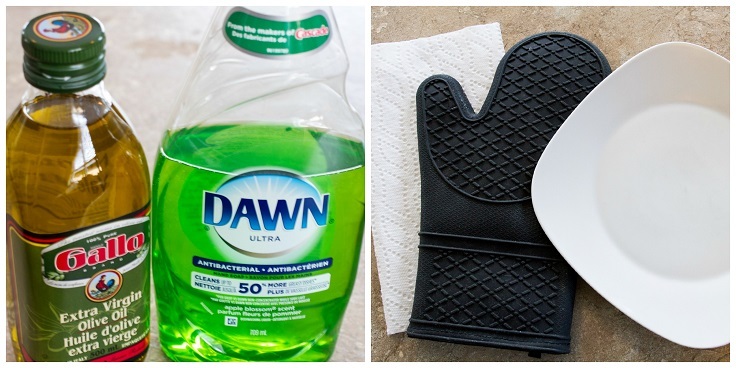 Baking soda is a great budget friendly way to clean up beauty tools. Mix lukewarm water and a teaspoon of baking soda in a glass, and leave the brushes to soak for a couple of minutes. Then rinse them under running water and dry them with the bristles facing downwards. Do NOT let your brushes dry standing up with the bristles facing upwards! Baby shampoo usually contains less chemicals than a regular shampoo. Therefore they are ideal for washing your brushes. Mix lukewarm water with a few drops of shampoo, leave the brushes to soak and rinse them under running water. Scroll down for more information on how to dry brushes. There are some brush cleaning mats available on the market that work pretty well. However if you would like save on the cost, you could optionally buy a regular silicon oven mitt and use it the same way. The texture of the silicon mitt can easily get in-between all the bristles and clean your makeup brushes from all residue. 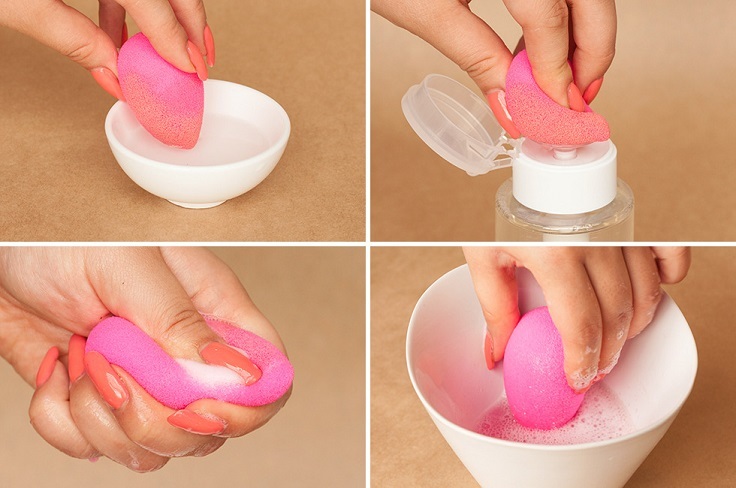 Don’t forget about the makeup sponges, they need a bath too! In fact they need it very often, ideally once a week. They are the easiest ones to take care of. Wet the sponge and dub a little liquid soap on it and start squeezing the dirt out of it. Rinse under running water and leave it to dry. Drying your wet brushes upside down is the most important rule one should follow. If you leave the wet brushes with the bristle facing upwards, water can drip down the bristles into the brush and loosen the glue holding the hairs together. Eventually it will ruin the handle and the hairs will fall out. This picture shows you how to secure brushes with an elastic hairband. When you are done cleaning the brushes make sure to clean the containers as well. It can also keep bacterias that were previously on the brushes as well. 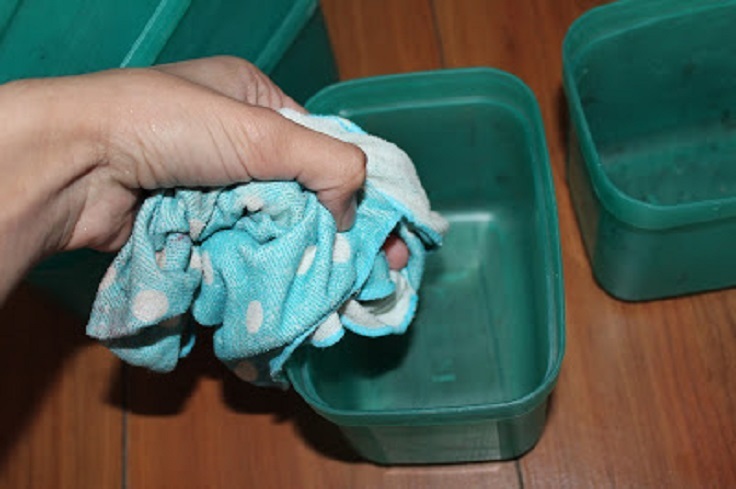 Simply clean the containers with soapy water and dry them with a clean towel. Now you are ready to put your nice and clean brushes back to their containers. First, I want to say I think you did a nice job of collecting some good tips for cleaning common makeup tools. I can, and most certainly do, appreciate the time and effort that goes in to creating such a post. However, I really can’t help being a little critical of the copious amount of grammatical and spelling error throughout this article. I had no choice but to re-read almost every sentence in order to understand this piece to its entirety. I’d be very surprised if English were your first language – and there’s nothing wrong with that – but for the readers’ sake, please have someone (who can be objective) proof read/edit your hard work before publishing it. Thanks again for your hard work and effort. I meant no offense by my comments and hope you take them as constructive criticism.